Wearing No 1 as the defending WCAR champion, Dan Marvin won five of the nine races held in 1984 in Jon Norman's Ralt RT4/83 and led almost half the laps, but found it hard to shake off the persistent challenge of Chris Bender. Bender won just one race in his Ralt RT4/83 but finished second four times and third twice, not too shabby in a car run just by Bender and one friend. Some good young talent was showcased by WCAR Atlantic in 1984 - JC Myers in particular - but the veteran John-David Briggs did rather it it all in perspective when he appeared for two races in his two-year-old Ralt RT4/82, winning at Laguna Seca and finishing second to Marvin at Sears Point. The other race winners were Hubert Phipps who won the opening race in his Ralt RT4/83 and Davy Jones who won at Riverside in October on a one-off appearance. Unsurprisingly, the Ralt RT4 won all nine races, took all nine pole positions and set all nine fast laps. A total of 68 drivers took part in the series, 46 scoring points. 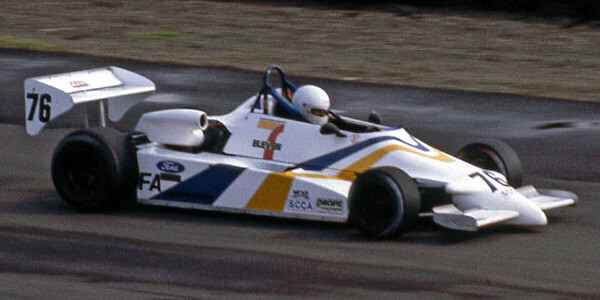 John Herne won the flat-bottomed class in a March 77B. Inevitably, WCAR had to be built from the rubble of the CASC series and there were no new cars to be seen until Hubert Phipps raced the Briggs Racing Ralt RT4/84 at Riverside in October.